We all have that one friend or family member who is constantly complaining about their stressful work and never-ending backache. Well, why not recommend them one of these cheap batam massage centres? Don’t ever think that cheap doesn’t mean good because we have we have summarised the top 5 charming and cheap massage centres. You will not burn a hole in your pocket and you will leave the centre all happy and perky! Address: Komplek Nagoya Centre Block B No.1,2&3, Jodoh, Batu Ampar, Batam City, Riau 29462, Indonesia. GO! Massage Batam is located 5 mins away from Harbour Bay Ferry Terminal & 200 metres away from Allium Hotel Batam. Treatment prices start from S$20 per person for a 90 mins massage. With quality that it brings, we are lucky it is one of the cheap batam massage centres on the island! How charming? Here, you are able to get all kinds of massages; traditional Indonesian massage, Thai massage, and their signature massage which is a combination of both Indo & Thai massage. They are also recognised as a winner of the certificate of excellence from TripAdvisor for 3 years straight from 2014-2016. Address: 2nd Floor Clubhouse Central Sukajadi The Central Sukajadi, Sukajadi, Batam Kota, Kota Batam, Kepulauan Riau 29444, Indonesia. Start your treatment off by enjoying their signature drink and warm & calming foot bath. This spa centre has massage options for those who are pregnant (pre-natal massage) and also for those who are very active and would like a sport massage. They will be using a combination of Thai and Japanese massage techniques, therapeutic stretching and compressions to improve muscles flexibility and relieve any form of tension. Address: Komp. Pertokoan Harbour Bay Mall, Jl. Duyung, Sungai Jodoh, Batu Ampar, Kota Batam, Kepulauan Riau 29453, Indonesia. Treatment prices start from S$10 per person for a 60 mins massage. You can’t really argue why this is one of our charming and cheap batam massage centres can you? Upon entering Manzu Family Massage & Reflexology Gallery, you will feel as though you are being transported to Japan due to the Japanese-centric design and layout of the centre. The dimly light settings will clearly make you feel relax & cosy. Personally, I feel that this is one of the most under-rated spa centres in Batam. Yume Shima is located 5-min walk away from Harbour Bay Mall. 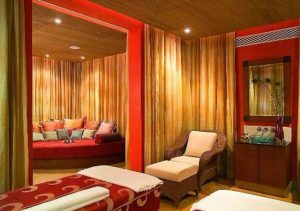 Treatment prices start from S$15 per person for their signature Ashiyu + Hot-Bed Spa + Foot reflexology for 90 mins. If this can’t be considered as one of the cheap batam massage centres, I dont’ know which one can!? 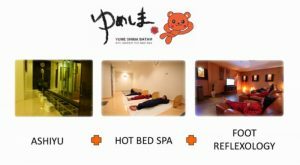 Yume Shima is the first spa centre in Batam that is not only Japanese themed but also offers Japanese treatments (Ashiyu – feet in hot water with stones & tiles) & hot bed spa where the bed is heated up. Stone spa is a rock bathing technique used a special stone to heat our body. These stones are set in a comfortable temperature of 40~45°C, which is safe and enjoyable for people of all ages. If you are not comfortable with the high temperature option, they can adjust it for you. The Stone Spa treatment also detoxifies the body to help ease shoulder discomfort, muscle stiffness, back pain, and eyestrain. Located near the Nagoya Hill Shopping Mall, Sakura Massage & Spa Batam is one place which takes feedbacks seriously and constantly improving their quality. Although quite pricey to be one of the cheap batam massage centres, it’s definitely a worthy mention based on their quality. 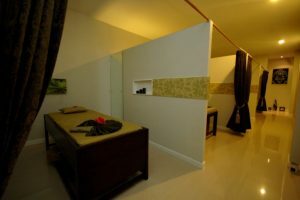 For those who are not keen on an “open-concept” massage room that is divided by curtains, you can upgrade to a VIP private room where you can have your full body massage and also body scrub. We do recommend opting for their ear-candling treatment to complete your spa experience. If you’re planning to go to Indonesia, or travel to Indonesia often, you might want to consider a learn Bahasa Indonesia for beginner course. Learn Indonesian Hub is one of the best centers to learn Indonesian language in Singapore. ← Indonesia Visa-Free Countries? Indonesia Visa On Arrival? Indonesia Tourist Visa? We answer them all here! All the info i needed! Thank you btmgtwy! I have book a 2 day 1 night package with Baram getaway, can we book massage via youtoo? will we get a better rate? How much will Spa central (Nagoya hils) 90 mins massge for 2 (separte rrom) on 9 Feb @ 4pm cost? Hi Sally, Thank you for your booking with us. We have emailed you with regards to your enquiry on the spa packages.